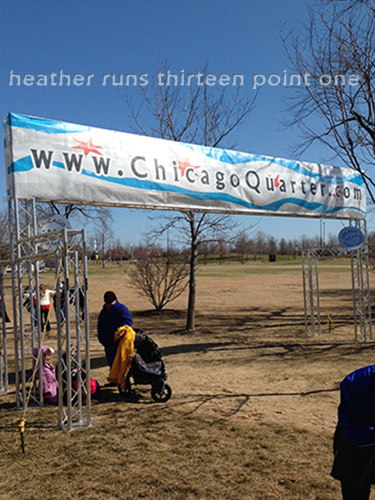 The Inaugural Chicago Quarter Marathon took place at 9:15 am on Saturday, April 5, with a start just outside of Soldier Field. What I loved about this race was that when my mom and I registered, we were able to get our packets mailed to us, rather than try and get to packet pick-up (especially when at the time of registration, there was no location specified yet). Convenience matters to me, and we registered soon enough that it was free! Score! From January 25–February 25, it was only $10, which I would have paid. Sometimes the locations for pick-up aren't close or convenient to get too. I prefer to take public transportation after work, but it's not always feasible depending on where it's at. So, whenever mailing is an option, I usually take it. I pre-paid for guaranteed parking at Soldier Field online Thursday afternoon, to ensure we'd have a spot, though I don't think it was necessary. We were there early enough that the lot was barely filled, but I like to have it taken care of so there's one less thing to stress about. I had a time crunch this day, so public transportation would have taken more time than I had. I prefer it because it's cheaper, but I have to say it was nice being able to leave a little later, get there earlier, and hang out in the car until just before the start. My mom and I got there around 8:00 am for a 9:15 am start, so we sat in the car, had some Nature Valley Honey & Oats granola bars, and chatted until about 8:45. We headed out of the parking garage, took a bathroom break, and then found some sun to stand in before lining up to start. The sun was warm, but the wind was a bit atrocious (especially on the second half running back north). 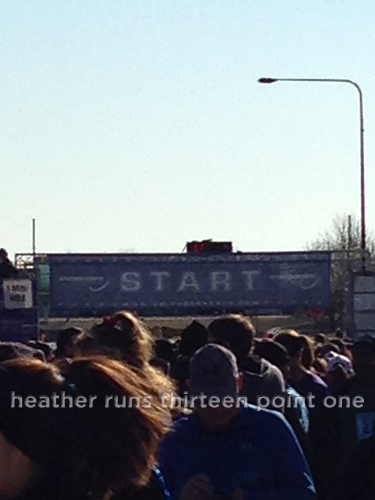 We lined up towards the back of the group, a bit behind the 12-minute mile pace sign. At 9:15 am, they started everyone – no waves. The race started off heading south down the streets around Soldier Field, which were leading towards the Lakefront path. It was a bit congested, but nothing too horrible. I started off pretty well with 2:1 run/walk intervals, which was about a 12:30 pace for the first two miles. Unfortunately, I started having some problems breathing (darn spring! ), so I had to change my run/walk intervals. I switched to 1:1, which slowed me down, but helped keep my breathing controlled. I was pretty warm, so took off my jacket and tied it around my waist. I was carrying a water bottle, so I didn't need to take any from the water stops (there were 2, but with the out and back, you hit them twice). It was sunny and lovely for the first half, but then at the turnaround, I regretted taking off my jacket. It had gotten so windy heading north and my arms were freezing! I didn't want to waste energy getting my jacket back on, so I just dealt with it. I ended up finishing with an average pace of 13:15 (I beat out nearly 200 people and I wasn't even last for my age group, whoo!). Not the pace/time I was hoping for, but oh well. When my breathing becomes an issue and I start coughing a lot, the only thing I can do is slow down and change my intervals. I'd rather finish than try and push myself too much to the point that I would need medical attention. Afterwards, they had bananas, bagels, and water. My mom was asking me where we got our medals, and I sadly had to tell her there weren't any for this race. For some reason, she thought this race had them (I'm guessing because all other 10k races we've done we received medals)... wah wah. I was under a tight time constriction that day (had to get home and shower for a birthday party), so we didn't stay for all of the awards or after party. It looked like there was a band, but I can't be sure. Overall it was a good race. 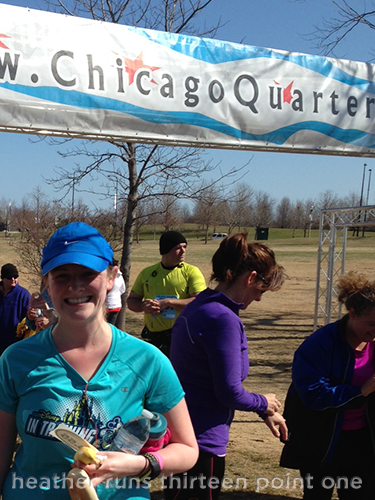 I think there were a littler over 1,100 runners, but the congestion wasn't as bad as some other Lakefront races. 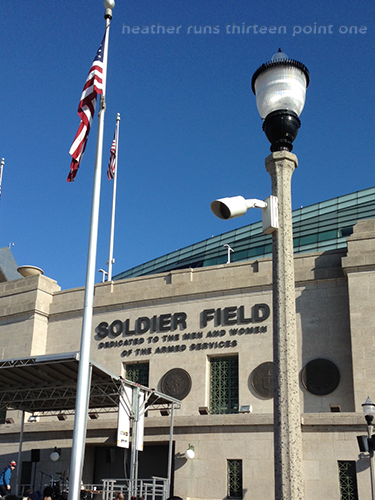 I do love the view on the Lakefront path, and being able to park at Solider Field was convenient. I'd say one thing needing improvement was the number of portable toilets – the lines were quite long. I also would have liked a Gatorade stop, or some at the finish line, but that's not a deal breaker (now, if it was a half marathon, it would be). Each participant received an official black full-zip fleece jacket (embroidered! 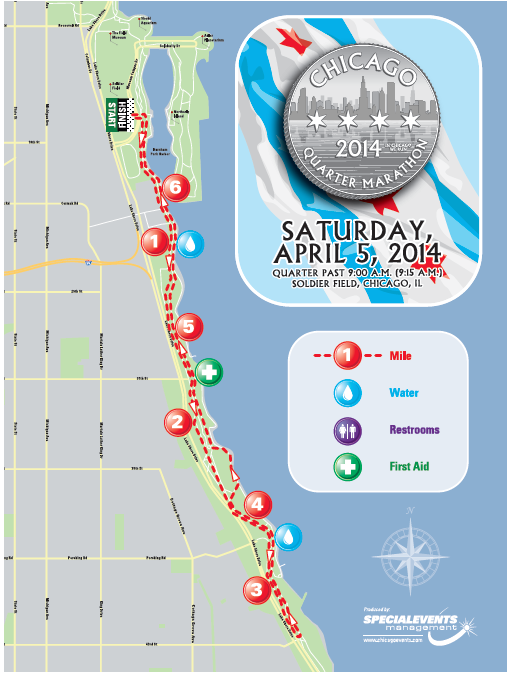 with the logo) for participating in the 2014 Chicago Quarter Marathon – they were quite nice (image below). I also liked that the race didn't start at 8, because I'm not happy about super early wake-up calls haha. I'll probably add this to the race list for 2015. Aww, that stinks that you didn't get a medal for this race. I bet your mom was heartbroken thinking she was going to get a medal at the end! Good job though! Thanks! She was disappointed because going into it, she thought there would be a medal at the end. It's always a bit of a downer when you think you'll be getting something at the end, and then don't.